AG2R La Mondiale’s Steve Houanard has been provisionally suspended after returning an adverse analytical finding (AAF) for EPO, the International Cycling Union (UCI) has announced. The 27-year-old Frenchman was part of his team’s roster at the Tour of Beijing, and has been immediately withdrawn from the race. The sample was collected in a random out of competition test on September 21st, and analysed by the World Anti-Doping Agency (WADA) accredited lab in Barcelona, Spain. Houanard is coming to the end of a two year contract with AG2R La Mondiale, having made a somewhat conflicted transfer from Skil-Shimano last year. His 2012 season failed to produce a result of note, with his biggest result being 22nd in the GP de Québec last month, and has yet to take a victory since turning professional in 2009. 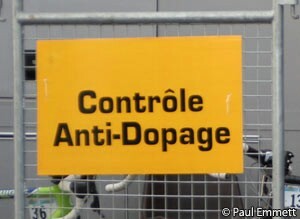 The French rider’s suspension remains provisional until a disciplinary panel from the French Cycling Federation (FFC) determines whether he has committed a doping violation under article 21 of the UCI Anti-Doping Rules. Houanard has the right to request, and attend, the analysis of the B-sample, should he want to question the AAF.